Food flavor obtained by using cedar grilling planks is increasingly popular in fine restaurants across the country, and now you can get the same results at home. 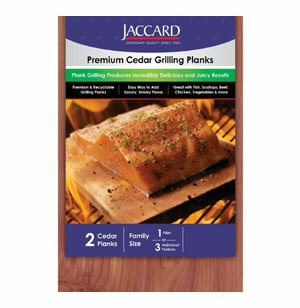 Introducing Premium Cedar Grilling Planks--the easy way to add savory, smoky flavor. Made of 100% recyclable cedar wood, these handy grilling planks are great for fish, beef, chicken, vegetables & more! And best of all, they can all be cooked on the planks separately or together to add sensational flavor to these foods. With these Premium Cedar Grilling Planks on your grill, you will get outstanding culinary results (with minimal effort) that you will be proud to serve to your family and friends.